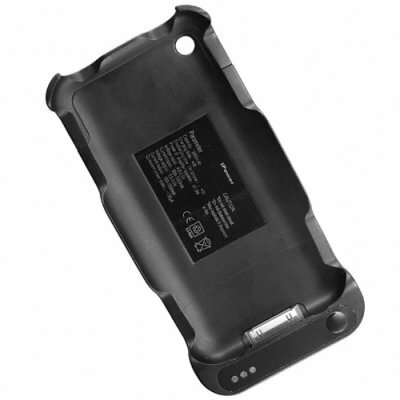 Successfully Added IPhone Battery Pack and Charger + Speaker to your Shopping Cart. iPhone Battery Pack and Charger + Speaker is the smart way to recharge your iPhone's battery when you need it most. If you are like most iPhone users, you just can't get enough of talking on your iPhone. Unfortunately, sometimes the iPhone's battery can't keep up with you, and you're stuck getting cut off in the middle of important calls and missing other calls completely. Now with this iPhone battery pack and charger, you can give your iPhone the extra power it needs to keep up with you and your many phone calls. This battery pack snaps right over the back of your iPhone and gives your more time to talk, listen to music, and take pictures. As an extra bonus, this charger also has an external speaker to provide extra audio quality for your iPhone. Once you try it once, you may never want to take it off your iPhone again! Before you go out, connect your iPhone to this charger, then connect your power cable to the charger. The charger will let the iPhone charge fully first, then the charger will begin to charge. Both devices will be fully charged and ready to go when you need them. When you go out and use your iPhone, the phone will take power from its own battery first, then it will take power from the battery charger as necessary. A blue LED indicator lets you know how much power is remaining in the battery charger at any time. This gadget is a must-have for everyone who loves talking on the iPhone. Get yours today and start talking longer tomorrow. Or pick up a few to plan early for the holiday season and to get the best price for resale. From your best source of high quality, low price electronics, Chinavasion. This gadget is compatible with the iPhone and the iPhone 3G.